In October 2004, excavation of fragmentary skeletal remains from the island of Flores in Indonesia yielded what was called "the most important find in human evolution for 100 years." Its discoverers dubbed the find Homo floresiensis, a name suggesting a previously unknown species of human. It has frequently been referred to as the ‘Hobbit’ species due to its small stature. Homo floresiensis went extinct about 50,000 years ago and now new evidence suggests it was Homo sapiens who were responsible. Homo floresiensis was first discovered in October 2004, when an excavation on the island of Flores in Indonesia yielded fragmentary skeletal remains of a hominid that is estimated to have had a height of only around 3 feet 6 inches. Ever since its discovery, Homo floresiensis has been the subject of much debate and intense research to determine whether it represents a species distinct from modern humans (Homo sapiens), or whether the remains belong to a modern human with a disorder such as microcephalia, a condition characterized by a small head, short stature and some mental retardation. Discovery News reported that “the Hobbit was a member of our family tree, belonging to the genus Homo and having descended from a population of Homo erectus that made its way to the island and shrunk in stature over evolutionary time due to the “island effect.” However, more recent research presented in the journal Nature suggests this human-like species might not have been human after all. Renowned paleoanthropologist Chris Stringer from the Natural History Museum in London, suggests that the Hobbit species did not belong to the Homo lineage but was descended from Australopithecus, a genus of hominids that evolved in eastern Africa around 4 million years ago, spread out across the continent, and eventually became extinct around 2 million years ago. There is still no final consensus among scientists on the issue. A study published early this year in Nature, involving dating work in the Flores cave, determined that the Hobbit species went extinct about 50,000 years ago. It was known that Homo sapiens were present in southeast Asia around that time, but there was no conclusive evidence that they had been on the island of Flores or had any interaction with Homo floresiensis at all. But now a new discovery of a pair of human teeth in the cave of Liang Bua on the island of Flores, again published in Nature, reveals that Homo sapiens were present on the island at least 46,000 years ago, suggesting their occupation did overlap with Homo floresiensis and that they may have been responsible for their extinction. “The teeth are slightly younger than the known hobbit remains, which strengthens the case that humans were responsible for the species’ demise,” reports Nature. While the evidence is far from conclusive, it does help to add another piece to a very complex puzzle. But still many questions remain, if the Flores skeleton does in fact represent a unique ancient species, how did it get to the island of Flores? How did they manage to survive until relatively recent times when many other species became extinct? Did they interbreed with modern humans? And what was the eventual reason for their disappearance? For now, the answers to all these questions are unknown but perhaps in time, we will learn the truth about what many believe is one of our most endearing relatives, the hobbit. I was struck by the unwitting irony of this line "Homo floresiensis was first discovered in October 2004". Well, no, they were first discovered by us 46,000 years ago! A Maori friend of mine told me of a story passed down from his mother about the “furry people” in the forest. I have to wonder if this is a “race memory”passed down through many generations. It was reading this article five minutes ago that brought that memory back to me. The finding of a couple of teeth infers the purposeful extinction of a different race of hominids? That's quite a leap of supposition. Unfortunately, I note that much of modern scientific "theory" going in the same direction. 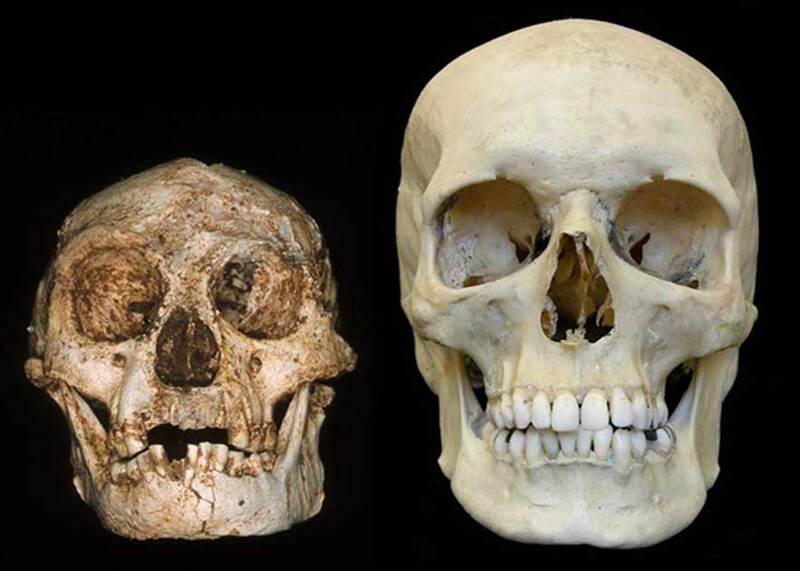 Do people realize that the hobbit skull compared to the modern human one (pictured above) are really no different to a modern European skull and a modern Pygmy skull of East Africa. Scientists Understand Why there are Short-statured Indonesians Today, But Can they Explain Hobbit Height? Read more about Scientists Understand Why there are Short-statured Indonesians Today, But Can they Explain Hobbit Height?